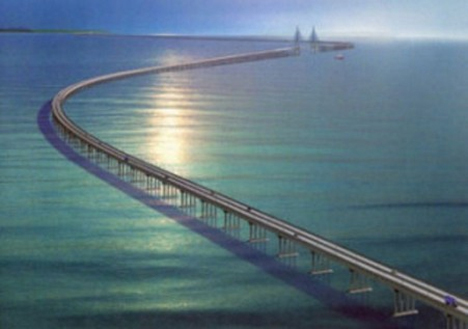 Overall, the link between the two countries will consist of a series of bridges and roads built on causeways. From end to end it will measure around 40 km (about 25 miles) and be suitable for both road and rail travel. 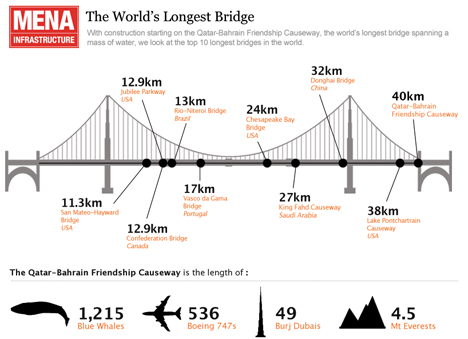 The picture above gives an idea of how massive this thing will really be, measured conveniently in blue whales and Mt. Everests. It’s a feat of engineering not only because of its size, but because the supports will pass through some very difficult water. The waters of the Arabian Gulf contain high levels of chlorides, sulphates and mollusks, all of which can be very structurally damaging. But all of that impressive engineering will come at a pretty steep cost: around $3 billion. See more in Mass Transit or under Transportation. October, 2009.